Wyre Forest law firm mfg Solicitors has been recogised by Cancer Research UK after facilitating more than £934,000 worth of gifts over the past 19 years from people choosing to leave a legacy to the charity in their will. 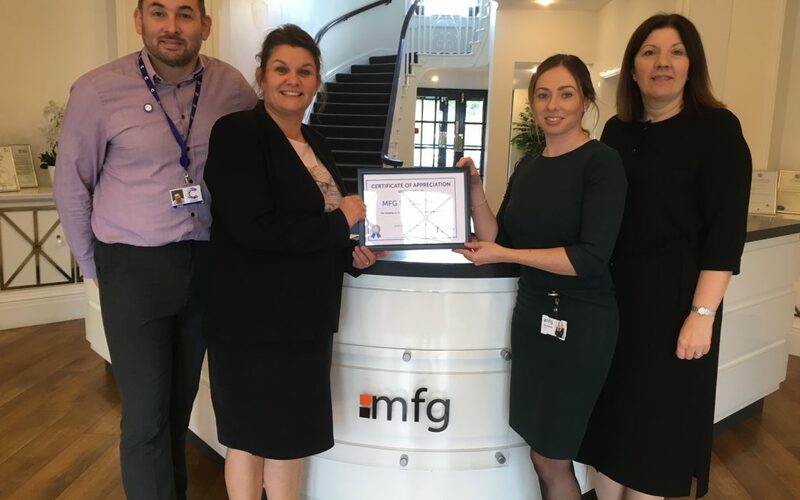 Kidderminster-based assocaite Rachel Summers and other members of the Private Client team were presented with a silver certificate to acknowledge the firm’s ongoing support and success. mfg Solicitors has been offering the Free Will Service to people aged 55 and over in the Wyre Forest for almost 20 years, giving advice and support for those wishing to write a will or update an existing one. As part of the service, the law firm provides guidance for those wishing to leave a legacy gift for Cancer Research UK. Rachel Summers, said: “A legacy gift can be anything someone wishes to leave in their will. Traditionally this is money but it could be anything that has a monetary value like an estate or specific item. Anything left to Cancer Research UK can be ring-fenced for research into a specific cancer type or research within a local area. “To play a big part in legacy gifts for almost 20 years is really important to us and we’re delighted to receive the recognition from a charity which does so much for so many. Clare Moore, Director of Legacies at Cancer Research UK, added: “We all reach a stage at some point in our lives where we start to look ahead and consider what will happen to our financial affairs in the future when we may no longer be around.